If I'm The Pinup King, this program between Share Our Strength and Shake Shack is fit for one! The two have teamed up for a cause marketing pinup program called the Great American Shake Sale at ten Shake Shack locations on the East coast. This modern roadside burger stand is committed to raising at least $25,000. People give a buck or two because they want to and don't need a shake to motivate them. But it sure does make a great thank you! 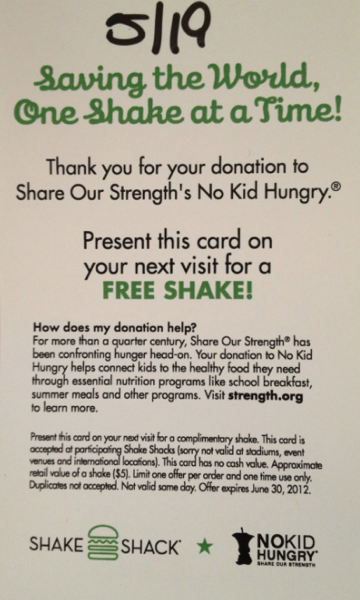 Share Our Strength is a national charity, but there's no reason your local nonprofit can't identify a company and run a successful pinup program. You could raise $25,000 like SOS will, or even more (Muscular Dystrophy and Lowe's Home improvement raised $7.6 million earlier this year). Thanks to my Friend Emily Kokernak in New York City for discovering and sharing this program with me! "I went in to buy a shake, and of course for $2 I did it - the shake alone is $5 there! ", said Emily. "It's a GREAT deal! Free shake - without having to buy anything. And - the people working there were really nice and tried to sell it - explaining the cause, etc. They had banners strung across the ceiling and it was really tasteful in keeping with their clean decor." Thanks, Emily. That's what good cause marketing is all about!